It’s cool. It’s refreshing. It tastes like something you’d get at a spa on Cinco de Mayo. It tastes like the color light green. When we were creating our menu for Chile Fest, there was no doubt what our signature cocktail would be: Jalapeno-Cucumber Margaritas. That episode also spotlighted the cowboy-hat wearing, tequila-shooting Tim Love. The Texas chef served up a jalapeno margarita with one of his dishes that left a big impression on us. We love jalapenos. And we love margaritas. Putting them together is an experience. You take a sip, think, “Wow! This tastes just like jalapeno, cucumbers, and tequila!” After 1-2 more sips, most people are done. A little goes a long way here so serving it in tall, chilled shot glasses makes the most sense to us. 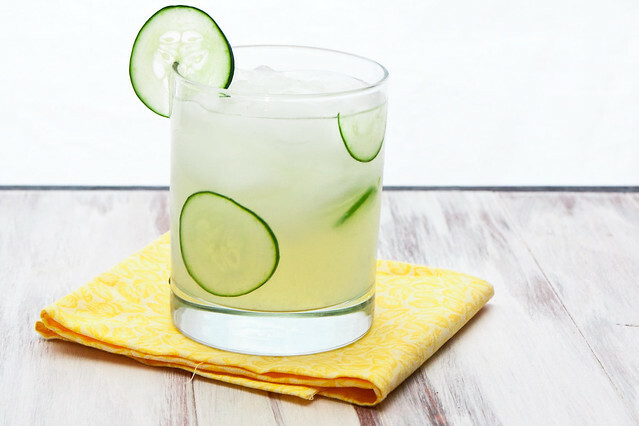 Jalapenos and cucumbers offer a unique, cool, and refreshing twist on the classic margarita. 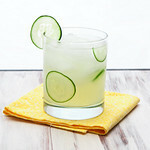 Chill for at least an hour (the longer the margarita sits, the more cucumber and jalapeno flavors infuse into the drink). What a clever idea !! It looks fabulous in your photo. Haha, we’ve seen that Morimoto episode – one of our favorites! Neat idea for a cocktail – it’s gorgeous. These sound amazing. I love combining sweet with heat and adding liquor!? It sounds heavenly and intense. Just made your original margaritas the other day, and they were so good! Now I’m definitely going to have to try these! Love the jalapeno kick.. if only I could have the tequila! Nothing like a little spicy cocktail to really get the party going! So long as there’s a fire extinguisher around…just in case. I love the sound of this! Tastes good. I was really impressed with the ingredients combination. Oh this sounds wonderful. I’m a big fan of spice in my drinks. A batch of this is resting comfortably in the fridge for later consumption. In the meantime, the recipe has been sent “from sea to shining sea” — WA, AZ, KY, TN, NC, TX, VT. Thanks!! These are chilling as we speak, minus the jalapeno because I don’t have any on hand. Regardless, I think these will taste great and look forward to toasting Nat’l Margarita Day with my hubby tonight. Thanks, Shawnda – cheers!